Slivered carrots and green onion in a sweet teriyaki sauce. A deliciously seasoned rice & vermicelli blend side dish that is quick and easy to prepare. 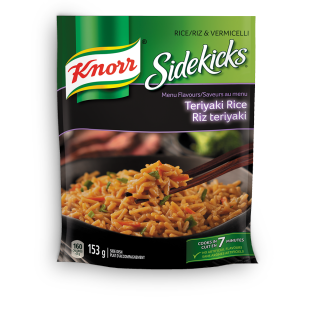 Knorr Menu flavour Sidekicks bring great restaurant-inspired flavours your family will love. Rice, wheat vermicelli, sugar, maltodextrin, soy sauce (soybeans, wheat, salt), dried leeks & carrots, onion & garlic powder, sesame oil, natural flavours, sea salt, potassium chloride, colour, seasoning, corn starch & modified corn starch, spice, disodium guanylate, disodium inosinate, salt, lactose, yeast extract (contains barley), sulphites. May contain milk ingredients. In an 8 cup (2 L) microwave-safe bowl, combine 2 cups (500 mL) water, 1 Tbsp (15 mL) vegetable oil and contents of package. Microwave uncovered at HIGH about 12 minutes* or until rice is tender. Stir and serve. *Microwave ovens vary; adjust times as needed.